MXF Converter for Mac offers users a best solution to import MXF recordings, shot by Panasonic P2 camcorders, Canon XF series cameras, etc., to optimal profiles (Apple ProRes, DVCPRO, HDV, Avid DNxHD, XDCAM, and Apple InterMediate Codec) for editing in Final Cut Pro, iMovie, Final Cut Express, Adobe Premiere, and Avid Media Composer, and so on. Also this Mac MXF Converter can convert MXF file to other popular video format like MP4, MPG, 3GP, MKV, AVI, WMV, FLV, VOB, SWF, DV, M4V, and MOV, etc. on Mac. Also this application supports converting MXF to 3D videos on Mac. It also has multiple editing functions to help you edit different MXF recordings instead of professional video editing software. Turn MXF video compatible with any player, including iPhone 5s/5c, iPad Air/mini 2 etc. The MXF Converter has numerous output profiles, covering all popular video formats, including MP4, MOV, MKV, AVI, WMV, FLV, SWF, M4V and popular HD video formats like H.264/MPEG-4 AVC, HD MP4, HD MOV, HD AVI etc. It supports all popular devices, including the latest iPhone 5s/5c, iPad Air/mini 2, Samsung Galaxy Note 3. After converting, the recorded MXF file can be played on your computer directly or on any other possible player. This MXF Converter for Mac supports optimal profiles for certain editing software, like Apple ProRes, DVCPRO, HDV, Avid DNxHD, XDCAM, and Apple InterMediate Codec (AIC). With it, you can easily import the MXF file to iMovie, Final Cut Pro, Final Cut Express, Adobe Premiere, and Avid Media Composer, etc. for further editing without any limitations. Tips: To convert MXF to Final Cut Pro format, please make sure the FCP 6(or above version) has been installed on your computer, otherwise the converted files will have audio only without image. If you use the FCP X, you may need to install ProApps QuickTime Codecs manually. Please download it from: http://support.apple.com/kb/DL1396. MXF Converter for Mac is able to convert a normal 2D MXF file to 3D video in MP4/MKV/AVI/FLV format. In the “Edit” window, this MXF Converter for Mac has the ability of adjusting the video effect like brightness, contrast, saturation, hue and volume. With the MXF Converter for Mac, you can crop the video frame to remove the unwanted edges, add watermark with text/image and define the text color, and merge several MXF files into one single file. This MXF converting software allows users to clip several segments from the source MXF file and you can specific the length of each segment. If you want to get the perfect video effect, you would open the profile settings window to define the video and audio settings like Video bitrate, encode, frame rate, resolution, aspect ratio, and audio bitrate, encode, sample rate, channels according to your preference. This MXF Converter for Mac software provides preview window of source file and the output video, when you edit the video, you can compare the two file effect to adjust. Also, you can capture the beautiful image from your MXF recordings when previewing in the main interface. 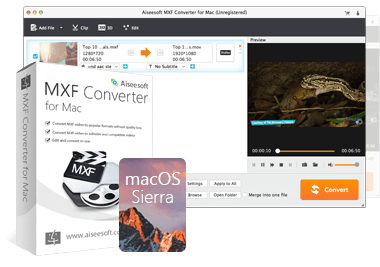 MXF Converter for Mac is simple to use, whatever you are a beginner or practician, all the converting process can be finished only in a few clicks. Apple iPad/iPad 2/the new iPad/iPad mini/iPad air, Apple TV/ATV 2/ATV 3, PSP, PS3, PS Vita, Xbox 360, Toshiba AT300, Motorola Xoom/XOOM 2, iPhone 4/4s, iPhone 5, iPhone 5S, iPod Touch 4g/5g, Acer Iconia Tab A200/A500/A700, Transformer Pad TF300, Asus Eee Pad Transformer, Samsung Galaxy Tab/Galaxy Tab 2, Lenovo IdeaTab, WDTV, Popcorn Hour, Xtreamer, HDTV, QuickTime Player, VLC, iTunes,Samsung, Kindle Fire, HTC, Google, Motorola, Acer, ASUS, Sony Ericsson, Toshiba, HP, LG, Dell,Windows Phone 7, Surface,PSP, PS3, Wii, NDS, Xbox,BlackBerry, Nokia etc. MP4 Side by Side 3D, MP4 Top and Bottom 3D, MP4 Anaglyph 3D, MKV Side by Side 3D, MKV Top and Bottom 3D, MKV Anaglyph 3D, TS Side by Side 3D, TS Top and Bottom 3D, TS Anaglyph 3D, AVI Side by Side 3D, AVI Top and Bottom 3D, AVI Anaglyph 3D, FLV Side by Side 3D, FLV Top and Bottom 3D, FLV Anaglyph 3D. This mxf software can successfully convert the MXF recorded by my Panasonic P2 to Avid MOV video. Then I can edit it easily.